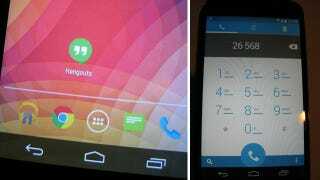 Some images of what’s alleged to be Android 4.4 appeared over the weekend, with screen captures of a phone supposedly running the new KitKat release giving us a look at what may be Google’s ever-so-slightly redesigned new mobile OS. The most obvious change of all is visible in the stock Android floating dock icons, which have lost their detail and shadowing and are now presented as simpler flat 2D options, in keeping with everyone’s favourite new design approach. It’s sad to see the smiley face SMS icon disappear, replaced by a boring representation of some text.